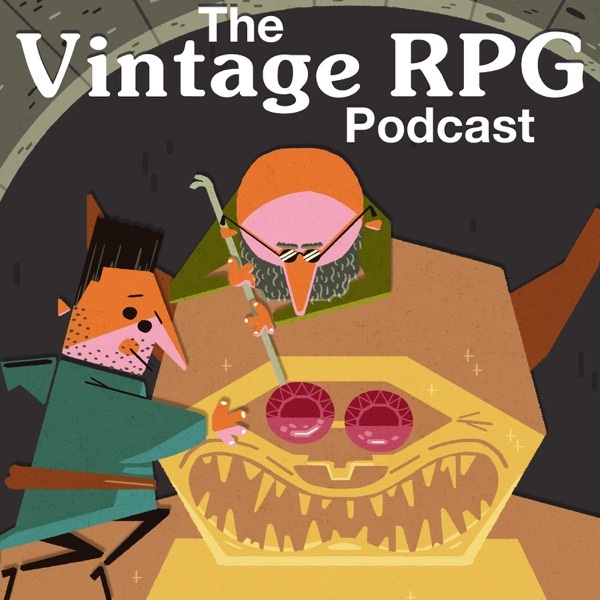 The Vintage RPG Podcast | Listen Free on Castbox. 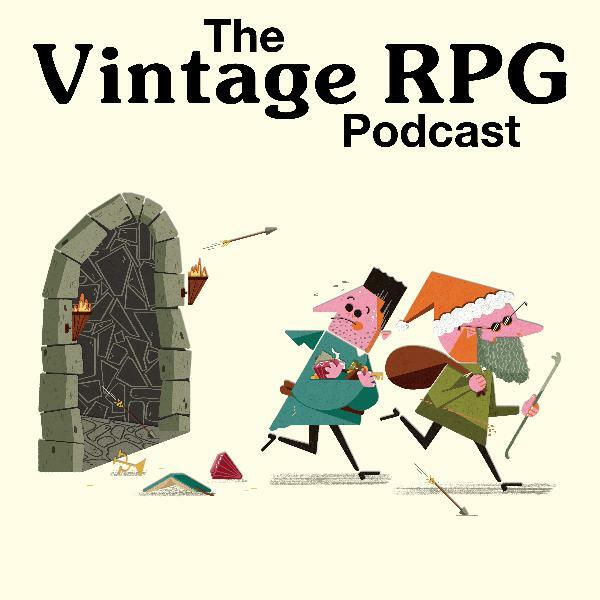 Join Stu Horvath (Vintage RPG, Unwinnable) and John McGuire (Mai-Tai Happy Hour, Ham-Fisted Productions) as they delve into their favorite tabletop roleplaying games from the past, present and future! We start by blowing the dust off an older board game, Cyclades, a deceptively straightforward, combat light strategy game with lots of cool miniatures that riffs on ancient Greek mythology. For the main event, we discuss GURPS - Generic Universal Role Playing System - from Steve Jackson Games, the RPG that can be any kind of game you want, so long as you have the sourcebooks. And dear god, there are a lot of source book. We look at a couple of the stranger ones, talk about the appeal of the generic and reveal some of our old Supers characters. We wrap up with Stu giving the rundown on character creation for his upcoming King Arthur Pendragon campaign. First up, we talk about Mixtape Massacre, a fun little independently produced horror board game that riffs on classic slasher movies and 80s pop culture. Our main course this week is the iconic Dungeons & Dragons Basic Set red box. We talk about its place in popular culture, where it sits in the larger history of D&D, touch on the other BECMI boxes, talk cartography, the importance of indexes and more. The Isle of Dread inevitably comes up, as does the Goodman Games reissue. Finally, Stu is excited about his great mail day and walks us through some of the cool stuff he picked up from Exalted Funeral. They sell very cool indie TTRPG stuff and occult books. Couple cool Kickstarters to hip you to, as well. The first, through Exalted Funeral, is The Ultraviolet Grasslands, a psychedelic road trip RPG. The second is Welcome to Tikor, the setting book for the Afropunk Sci-fi/Fantasy RPG Swordsfall. Both campaigns have crushed their goals and we're sure to be talking about them a lot in the future, so consider getting on board now. Long episode for you this time around! We kick things off with a couple of unusual Beginning Readers books from Chaosium, R. J. Ivankovic Dr. Seuss-esque adaptations of H.P. Lovecraft's The Call of Cthulhu and Dagon. We also discuss the new Call of Cthulhu Starter Set, a box set packed with short scenarios and an introductory version of the rule meant to be a gateway for beginning RPG players. Finally, we have a long chat with James Lowder (Ring of Winter, Prince of Lies) about his work at Chaosium, as well as his long history in the RPG industry as an author, fiction line editor and game designer. Interesting anecdotes abound! James Lowder, Cthulhu Starter & Dagon, Oh My! We start off discussing the tile placement/currency exchange game Alhambra, which is themed around the 14th century construction of the Alhambra palace in Granada. The main course this week is Spelljammer, the space fantasy setting for D&D released in 1989, in which players sail ships into space. It is exactly as weird and silly and bizarre and absolutely awesome as you imagine. We wrap up answering questions from our listeners! We start off talking about Steve Jackson Games' Munchkin, specifically the Teenage Mutant Ninja Turtle variant. It features art by Kevin Eastman and some rules variants that may surprise you if you're a long time Munchkin players. In the main segment, we talk about Masks of Nyarlathotep. What's that you say? We've already covered Masks on a previous podcast? Well, yea, that is true, but Chaosium released a new, updated version of the campaign last year and they changed enough of it that we think it warrants a revisit. Finally, we talk to Ryan Verniere and Carmen Acosta, two of the folks behind the upcoming Auction of Many Things, a Los Angeles auction of D&D-inspired art benefiting the surviving creators of Dungeons & Dragons. If you're in LA, you can attend the auction on March 2. Follow @DnDArtshow on Instagram to see all the awesome art and to keep updated on future events! This week, we’re playing Heimlich & Co., a modern issue of a clever espionage-themed game originally from 1984 (you may know it as Top Secret Spies, Under Cover or Detective & Co.). Over on our Patreon, folks who back us at the $25 level get to call the shots for an episode. This week, Sara Clemens asked us to cover Mouse Guard, Burning Wheel’s RPG adaptation of David Petersen’s beautiful comic series. Over the holiday break, we made some characters and ran the game so we could give you our impressions. It is pretty cool! We wrap things up discussing Stu’s recent experience setting up a Blades in the Dark game on Roll20. This show is entirely dedicated to the works of the late, great Greg Stafford, who we dearly miss. Stu takes the helm and starts us down Stafford’s tabletop RPG history with the wargame White Bear & Red Moon (also known as Dragon Pass). From there, he touches on RuneQuest, the Ghostbusters RPG, the entire world of Glorantha, HeroQuest and Pendragon, all the while trying to convey how widely Stafford’s work influenced the hobby. We’ll be covering most of these games in more depth on the Instagram feed this week, so look for that. Happy new year! For starters this episode, we check out the seance-themed board game Mysterium. It is sort of like Clue meets Dixit, but spooky. The main event is TSR’s Marvel Super Heroes RPG. We revel in some 80s-era nostalgia, discuss the weirdness of the game and somehow wind up on the 1987 Macy’s Thanksgiving Day Parade Marvel float. Seriously, go watch that video. We also talk about Blades in the Dark, a dark fantasy heist RPG that Stu is preparing to run online for members of the Unwinnable staff. Happy holidays, folks! We’re breaking from format this episode to dig deep into the nostalgia and look at the Sears Wish Book, an important part of our childhood Christmas experiences. Specifically, we’re looking at the catalogs from 1982, 1983 and 1984, which contained, you guessed it, Dungeons & Dragons stuff. They are so much more than that, though, as you’ll discover when you listen! And, while we have you, let us offer our tremendous thanks for following Vintage RPG on Instagram, listening to the podcast and making this whole project fun and rewarding on a daily basis. All the best this holiday season! It is Stu’s Birthday! We lead things off with Chaosium’s Khan of Khans (01:30), a fast-paced boom and bust board game about cattle thievery in Glorantha, by Reiner Knizia. The main event: Dragon Magazine (05:38). Stu gives a brief history of the publication (06:00). Hambone remembers seeing it in book stores in the mall (07:45). Stu reveals how Dragon Magazine gave him the collecting bug (09:41) and how his large run functions as a sort of history of the tabletop RPG hobby (11:00). Stu talks about how editor Tim Kask worked to keep Dragon semi-independent from TSR (13:00). Editor Roger E. Moore’s tenure comes up (13:54) along with Dungeon Magazine. While Dragon slowly became an advertorial publication, Stu doesn’t mind because it allows us to see D&D evolving on a month to month basis (15:00) and Hambone segues into the Dragon+. Stu gets into Dragon’s experimental tendencies (17:30) and explains how Forgotten Realms was (kinda sorta) born in the magazine (19:22). Preservation comes up (21:00). A brief encouragement to subscribe to Unwinnable Monthly during our Holiday Subscription Drive (24:25). Stu gets excited about completing his Planescape collection (25:00). See you in two weeks! * Clarification: Stu meant Rubbermaid, not Tupperware Correction: Despite his whip-fast certainty, Stu was wrong. Pong came out in 1972.